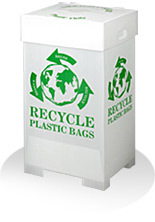 Recycling - Advance Polybag, Inc.
It’s Easy to Recycle Plastic Bags! Advance Polybag®, Inc. supports sustainability initiatives that are conducted in accordance with the principles of the Plastics Industry, namely, the practice of conserving resources, while minimizing negative environmental and health impacts of plastics and plastic products. Accordingly, we are committed in our continued focus on sustainability when it comes to the manufacturing, distribution, use and re-use of our plastics. Recycling is a key component in our mission to help our partners and customers maintain a results-driven commitment to sustainability. Consumers have the freedom to reuse bags and/or recycle them, just as with almost any consumable good. Plastic bags can be placed inside recycling bins, which are increasingly being made available on-site at the places they shop (primarily supermarkets and discount chains). We believe that retailers who participate in a Recycling Collection Program not only reinforce the positive habit of recycling, enhancing their image with regards to sustainability, they also provide an added convenience to the customers, many of whom want to participate in recycling.